Dog walking service brings your pet to the woods. "Nothing gives me the kind of joy I feel watching my girl run freely out on the trails." writes Heather Sinclair. Her "girl" is Ella Mae, a rescued dog of indeterminate breed, and the trails are in dog-friendly parks like Point Pleasant and Shubie, and more remote woodland areas in places like Long Lake and Sandy Lake. "It didn't take long to realize I needed her as much as she needed me as she brought so much joy and purpose to my life. She is my friend, my teacher, my defender and sidekick." 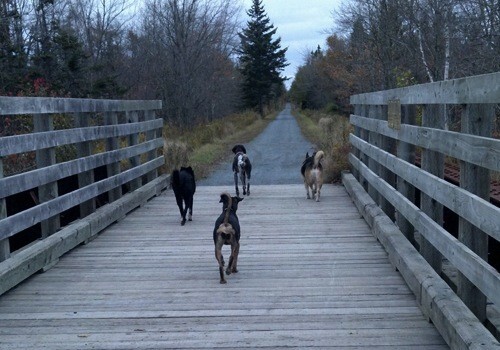 Sinclair has a degree in outdoor recreation management from Acadia University, so it was only natural that her daily walks with Ella Mae have evolved into a business---Tails to Trails (266-4453), a registered, insured and bonded dog walking service. For 20 bucks, Sinclair will take your dog on a walk; walks are limited to a maximum of six dogs, and take about an hour, although she adds that "the hour may stretch a little longer if everyone is happy and having fun or may wrap up a bit early if dogs are cold and wet." There are discounts for multiple weekly walks, and Sinclair has good customer service instincts: there's free in-home consultation, she picks up and drops off the dogs and she sends a follow-up email after each walk to let you know the dog is home safe and to tell you what kind of adventure it had. "Lots of pets, 'cuddles' and love guaranteed every walk, every time!" she adds. There's something beautiful about someone who so clearly loves her job, and it's a real joy to wander around Sinclair's website.